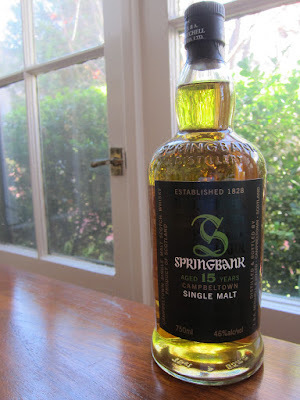 Springbank 15yo (46.0%): About a month ago just before I left Cambridge a friend of mine sent a bottle of Springbank 15yo as a thank you gift for some help I offered to them a while ago. The note attached to the bottle said: "Everything is better with a bottle of Springbank..." Well, it is indeed... I don't deny that I favor anything coming out of Springbank Distillery but Springbank 15yo has been always one of my favorites. And on top of everything this particular bottle survived the trip all the way across the country from Cambridge to West Hollywood. So, I think I shouldn't let it stay uncorked on the shelf any longer and pop it open at this beautiful weekend... Color: Light amber, oaked Chardonnay. Nose: Salty olive brine, wet black gardening soil, heather, burnt orange peel and quince paste. Crushed peppermint leaves, Dole canned pineapple rings, guava and salted caramel drops. Oily hemp ropes on a deck of a boat, rosemary and diesel fuel. Palate: Creamy, thick but also pretty chalky... Peat, campfire fueled by pine wood, cinnamon sticks and dried whole cloves. Green gummy bears, cooked zante currants Niederegger chocolate marzipan loaf and dried papaya slices. Cold pear and apple compote. Finish: Dry and long. Oak, sizzling black pepper and cloves. Still smoking campfire you wake up next to at dawn and pipe tobacco. Overall: Every batch is slightly different but always so good... A blend of perfectly well chosen sherry casks. Layered with bold notes like an old and mature whisky but also vibrant and energetic at the same time like a youngster under ten years old. If I had to find an equivalent style for this whisky it would be Lou Reed rocking in 1990's... Well, truth to be told: If I was making more money, Springbank 15 would be my everyday whisky, period but for now I will take it easy and make sure that this bottle will last long enough in this household... Highly recommended.